Got any pictures of the Macro world ?...In all their awe and splendor some of the most beautiful things can only bee seen with a microscope ! Here's the AIDS virus ! PLEASE REMEMBER TO CREDIT THE SOURCE FOR ANY MATERIAL YOU POST HERE. Spermy wermy wooing eggy weggy !! This is a cell living inside my body right now! Crystal structure of a protein involved in cell division and cell wall biosynthesis from Mycoplasma pneumoniae, a bacterium known to cause pneumonia. 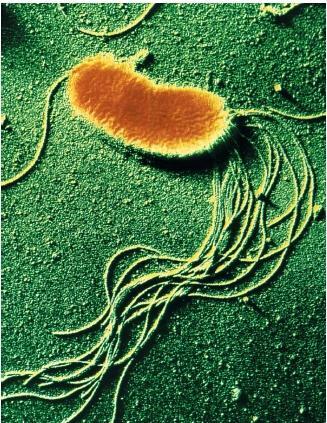 Mycoplasma pneumoniae is a very small bacterium, in the class mollicutes. This class of organisms lack a peptidoglycan cell wall present on all other firmicute bacteria. Instead, it has a three layer cell membrane which incorporates cholesterol compounds, similar to eukaryotic cells. Lacking a cell wall, these organisms are resistant to the effects of penicillins and other beta-lactam antibiotics, which act by disrupting the bacterial cell wall. M. pneumoniae has one of the smallest genomes known, with 800 kilobase pairs (kbs). 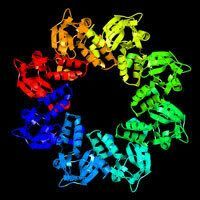 Its genome and proteome has been fully characterized. It uses some unique genetic code, making its code more similar to mitochondria than to other bacteria. It lacks the cellular machinery for making many essential compounds. Because of this, it is an obligate parasite. No mycoplasma is found free-living. In this respect, mycoplasma is more similar to viruses than to bacteria. M. pneumoniae is spread through respiratory droplet transmission. 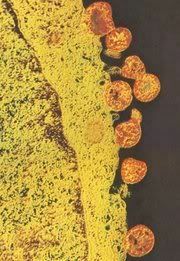 Once attached to the mucosa of a host organism, M. pneumonia extracts nutrients, grows and reproduces by binary fission. Attachment sites include the upper and lower respiratory tract, causing pharyngitis, bronchitis and pneumonia. 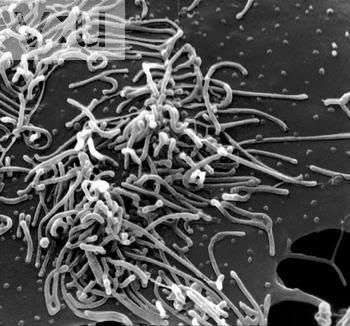 The infection caused by this bacterium is called atypical pneumonia because of its protracted course and lack of sputum production and wealth of extra-pulmonary symptoms. Chronic mycoplasma infections have been implicated in the pathogenesis of rheumatoid arthritis and other rheumatological diseases. Second generation macrolide antibiotics and second generation quinolones are effective treatments. Disease from mycoplasma is usually mild to moderate in severity. 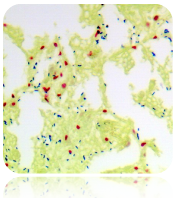 Mycoplasma pneumoniae On the surface of a cell - M. pneumoniae is a common cause of mild pneumonia. 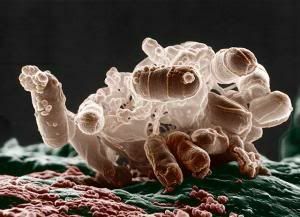 This bacteria is unusual in that it lacks a cell wall. this one is human lung cancer cells. these cells are stained for E.Cadherin as well (green) but the cells are shped differently, and grow in a perfect alttice with eatchother, so you see the different pattern of the same protein in different cell types. breast cancer again, different protein stained in green this time. this one localizes mainly in the nuclei so you see it in a different place. red is once again the cells skeleton. the cameras just don't do these flourescent dyes and antibodies justice. they are SO pretty when you actually see them in the microscope. i love my job!!!! Posting this now to remind myself to come back to this thread and post some photos I have when I get home. I was bored some time ago and I was explaining to a guy how nasty paper money is (who apparently never did this "fun" little experiment in high school. 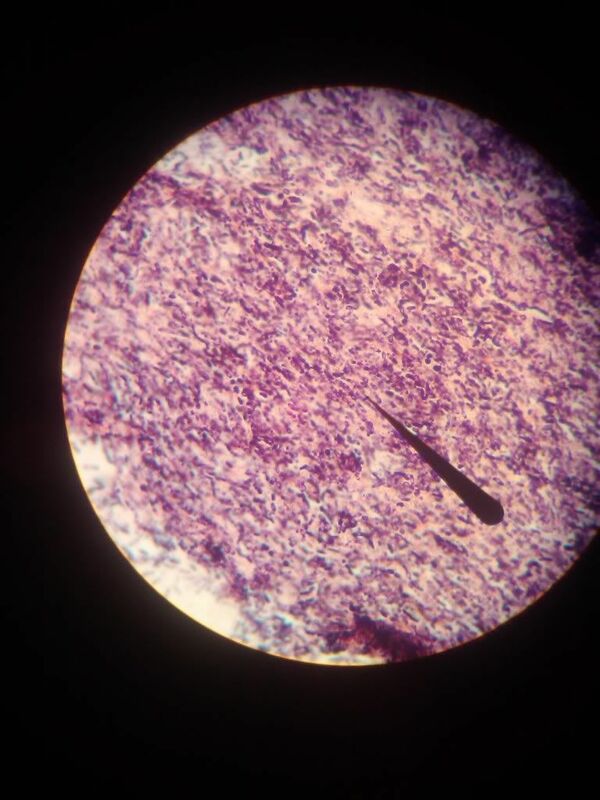 We placed a bet on just how bad it is and when I ran a swab and incubated it, you would not believe the degree of gram-positive bacteria that I found. 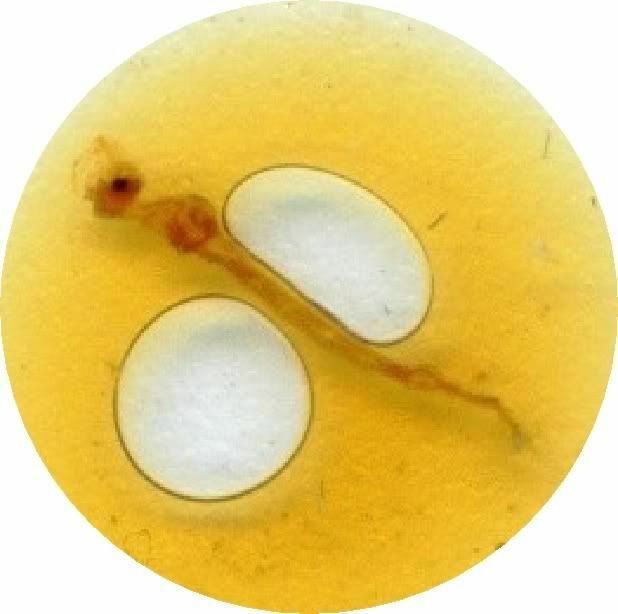 Does anyone have good images of the Helicobacter pylori that was presented a few podcasts back? 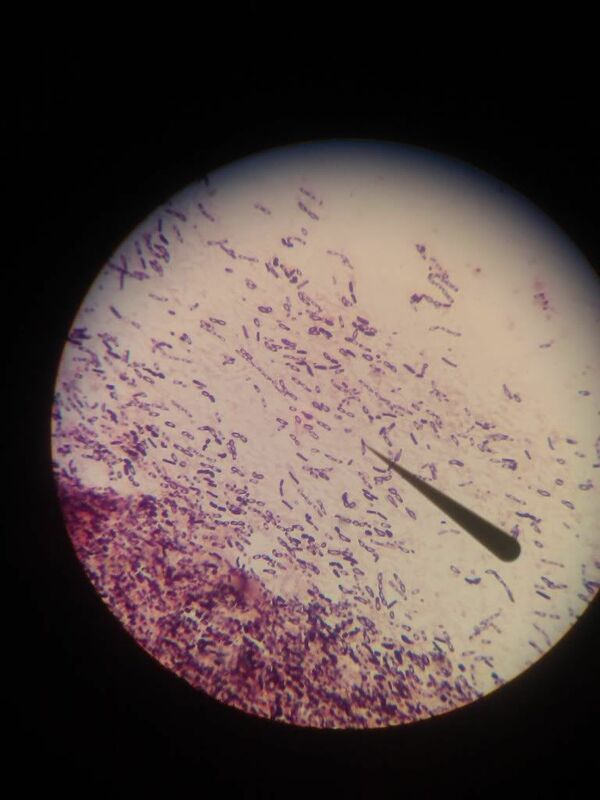 The Gram Stain Kit (Modified Brown & Brenn) is intended for the demonstration and differentiation of Gram-positive and Gram-negative bacteria. Image courtesy of Sean Pham, from this article, Where is the HIV vaccine. Each of the blue blobs in the above is an individual HIV particle or "virion" and it measures about 100nm - that's about 1/10,000th of a millimetre. Could we please have some bars so that we know how large these organisms are. Yes, sorry, they were not present on the original images. Why did AIDS become known as HIV-AIDS in medical news? How are very short half-life medical radio isotopes produced and stored? Can I donate my still-living (but somewhat worn) body for medical research? Is the quality of doctors coming out of medical school falling? Page created in 0.168 seconds with 76 queries.